Professional training. Simpler logistics. Better results. This local program offers a more personalized approach to improving your child’s skills while staying focused on fostering a passion for soccer and on the fun of competition, with an ultimate goal of keeping players in the game long-term. 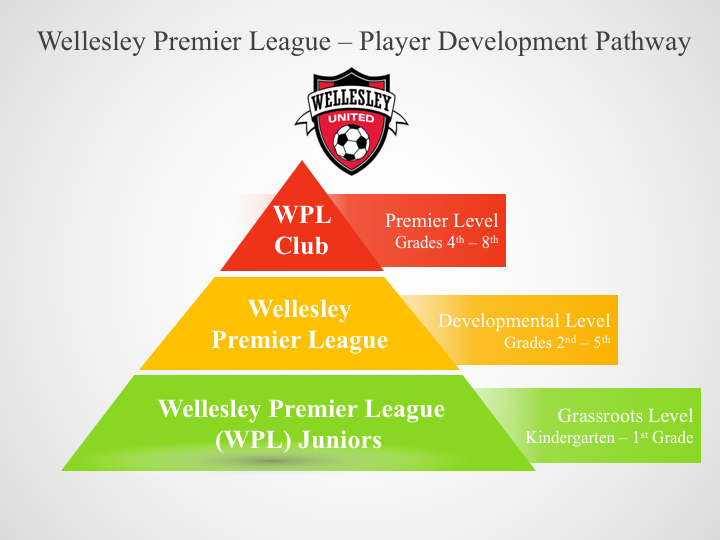 By playing with friends, in a competitive AND fun environment, the Wellesley Premier League is a great option for providing your child with advanced training. The goal of the WPL program is to provide the best soccer development experience for those interested in reaching their maximum potential. In order to do this, the program aims to instill an environment of respect & enthusiasm for the sport of soccer, to promote good sportsmanship and to develop the tactical, technical, psychological and physical elements necessary to be quality WPL soccer players. Simpler logistics: Local, local, local ….all sessions will take place during the week and will be located in Wellesley. English Premier League simulated tournament creates a fun, yet competitive environment throughout the season. “Very cool” uniforms provided to all players. This program does not replace or interfere with the in-town Wellesley League or BAYS.